Most climate researchers believe that climate change will profoundly impact both our planet’s environment and the world’s economic and geopolitical landscape in the coming decades. Since these impacts have the potential to effect everyone, a basic knowledge of the Earth’s climate system is critical in order to make informed judgments about climate-related issues. To achieve that goal, educators need resources to engage their students in the scientific and technological processes scientists use to forecast climate change. Computer-driven global climate models (GCMs) are one of the primary tools used today in climate research, but until now they could not have been much more than a “black box” to the general public. As a practical matter, few educators have had access to GCMs, which typically required supercomputing facilities and skilled programmers to run. The resulting lack of familiarity with climate modeling techniques has often engendered public distrust of important scientific findings based on such methodologies. 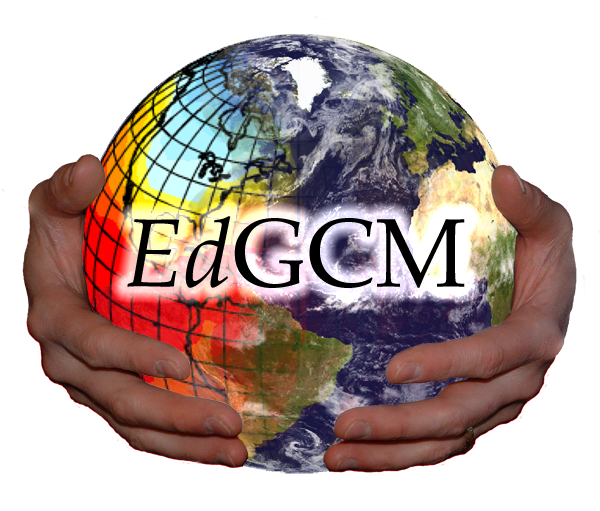 EdGCM changes all this by providing a research-grade GCM with a user-friendly interface that can be run on a desktop computer. For the first time, students can explore the subject of climate change in the same way that actual research scientists do. In the process of using EdGCM, students will become knowledgeable about a topic that will surely affect their lives, and we will better prepare the next generation of scientists who will grapple with a myriad of complex climate issues. EdGCM is a project of Columbia University and is not an official NASA activity. All license fees for the software go to the Trustees of Columbia University and are used to pay for equipment, network connections, and support services for the EdGCM Project.